Villa for sale in Denia. Beautiful villa with 2 apartments, each with 2 bedrooms, 2 bathrooms, living/dining room. The plot has 1000 m2 with barbecue and swimming pool. Garage in the House. Gas central heating. Beautiful, quiet and central location, only a short ride to the beach or to the Centre of Denia. Schools and nearby shopping malls. Town, 1 km, Beach 3 kilometres. The 1000 m2 plot next to the house is on sale also. Villa in Denia for sale in the town outskirts with 271 m² built on a plot more than 23,000 m² which is in the process of reconversion to urban land. The ground floor is completely renovated and ready to enjoy your stay, while the upper floor is completely independent and needs to be completed. It is very spacious, ideal for 2 families or for a large independant apartment for renting it. This beautiful Mediterranean-style house has 3 double bedrooms and 2 bathrooms (on the ground floor) and individual exits through 3 large doors. There is a large bright living room with fireplace, ideal to snuggle in the fire in those days of winter, overlooking the land. The large fully equipped kitchen has direct access to the terrace, also Mediterranean style where in the summer you can enjoy freshness and very pleasant shade. There is a water well on the outside and a barbecue that overlooks the large lot. The property is very close to the city and all amenities. 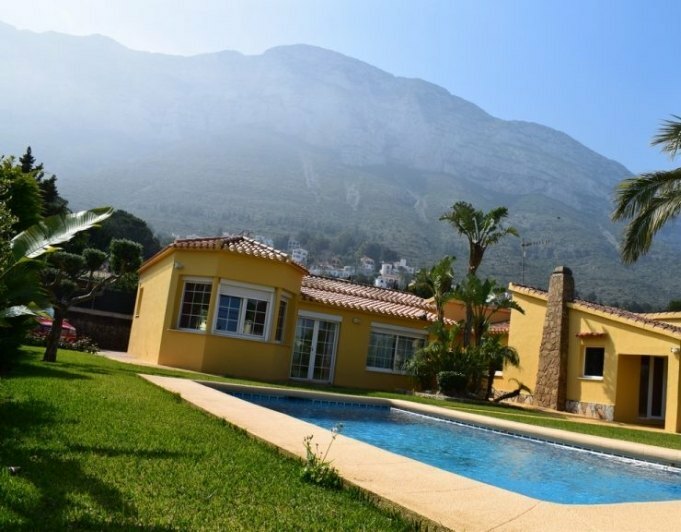 Villa in Denia for sale, Great views of the castle , the sea and Montgo mountain. 1 km from supermarkets , schools and beach . Plot with garden, and swimmingpool , ground floor and basement, garage, central heating, ​​155.8 m2 built and consists of large entrance hall , dining room with fireplace , three bedrooms (all with fitted wardrobes), bathroom in the master bedroom , toilet , shower, kitchen , laundry room and covered terrace. Reinforced door , alarm,. The basement - garage has an area of 63 m2 with a large storage room . There is possibility of major expansion of this level , as well as a height increase in the house. Villa in Denia for sale, with fantastic sea views and several terraces, in a quiet residential area only a few minutes from the yacht club, Denia town center, beach and all services. Guest apartment. 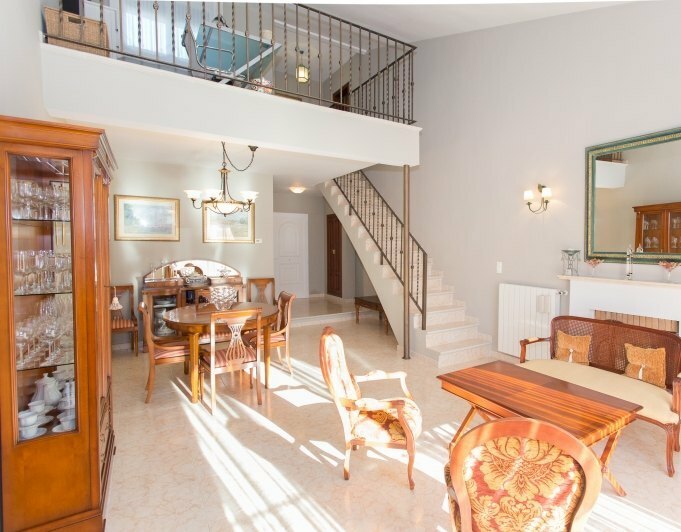 Villa in Denia for sale only 400m from the sand beach. Walking distance from supermarket, restaurants, parks and 1km to Denia town center. Swimmingpool 4x8, garden. Very quiet street near sports area with new indoor swimmingpool, gym, spa, football and tennis club. Perfect for all ear living or as a holiday house. A beauty in nature. Coquettish villa with panoramic views of the sea and the mountains.In this house aesthetics and functionality reach an harmonious balance. Large windows allow you to enjoy views to the idyllic spot, creating a pleasant atmosphere in a sunny and bright home. The house is distributed on one level and has a large living room with access to the garden, the master bedroom with bathroom en suite, modern kitchen by Bulthaup and household appliances of the brand NEFF. The carpentry is of aluminium, the doors and wardrobes are of the highest quality of the market. Underfloor heating, cold and hot aircon, covered terrace, porch. The construction is solid and elegant, has its own and very practical style designed in every detail to lead a comfortable life. The garden is easy to maintain with automatic irrigation, a part of the plot borders with the Natural Park of Montgo than conveys a sense of calm and tranquility.The house is located in a quiet and residential area in Marquesa VI. Villa for sale in Denia, only 3 km from Denia town center and 90 m from the sandy beach. Villa in Denia for sale. The House has two dining rooms, four bedrooms, two bathrooms and a toilet, two kitchens, BBQ cover with top and water hot, pool, poolside room bathroom and dressing room, spacious terraces with great views of the city to the sea and Montgo natural park, air conditioning, parking and garage, very sunny, with Palm trees, trees, two km from the Centre of the city and the beach, there is possibility of drilling a well with fresh water. NEW!! Wonderful villa located in a flat and very comfortable sunny plot, close to the city and all services.It is a large house with many interesting details that help to enjoy life at home. It has central heating in all rooms, including towel rails in the bathrooms. In addition, the house has air conditioning in the living area and the master bedroom. The lounge is spacious and sunny, but there is also another living room for common use.The kitchen is large and very complete. Osmosis with automatic cleaning system available.The outside area is very nice and wide, with an indoor pool that keeps water at very good temperature throughout the year, in addition to a fully closed summer kitchen ideal for routine use and celebrations. Garden irrigation is automatic, and there is a perforation with irrigation pump.It has a spacious garage with automatic doors, shelves and a large wardrobe with six doors.Parabolic antennaAll windows have bars and, in addition, there is a perimeter and internal alarm system installed. Spacious villa located in the area of Santa Lucia, 2 km from Denia and 1.5 km from the sea. Plot of 1.200 m2 completely flat and sunny. A single storey house with 220 m2 built with 6 bedrooms, 3 bathrooms, a spacious livingdining room, and another lounge and gambling room next to the bedrooms, large fully equipped kitchen with office. All the common rooms as well as 2 of the bedrooms have direct access to the beautiful Mediterranean garden and the large swimming pool. The villa is completely renovated in 2002 with magnificent qualities, has cold a/c by ducts and gas central heating. There is also a closed garage, a carport and parking for several vehicles, BBQ and laundry area. Fully equipped and ready to move into, very private and quiet, ideal for year round living or relaxing holidays in Denia. Villa in Denia for sale, Las Rotas, with two dwellings, just 10 minutes walking distance from the sea and Denia town centre. It has a total of 6 bedrooms, 3 bathrooms, 2 living rooms, 1 kitchen in each floor, terraces and a summer kitchen. It also has a garage and parking and storageroom. Located in area with more demmand in Denia and near schools, restaurants and all amenities. There are also some services at walking distance. Villa in Denia San Nicolas for sale to renovate. Only 250 m from the sea and less than 1 km from Denia town center. Licence and project included. San Nicolas hill has the highest demand in Denia so this property will not be in the market for long time.